It’s easy to get excited about your new log home space and try to create a colorful landscape right out of the box. However, if your gardening skills are limited or you’re not sure what will work in your new location, planter boxes, window boxes, hanging baskets and other portable options are a good way to experiment before making a big landscaping commitment. 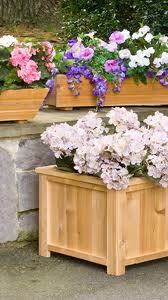 If you’re looking for an attractive solution for portable garden accessories, Cedar Ideas (the sister company of Katahdin Cedar Log Homes), transforms the scraps from our house manufacturing line into beautiful planters and window boxes. They can brighten edges of porches, patios and entryways and provide the essential durability that cedar provides in our log homes. If you’re trying to see what plants will thrive in your new space, try planting annuals and perennials in combinations based on soil type and sun exposure. Set them up in areas where you envision garden beds to simulate the effect the conditions might have on the plants themselves. 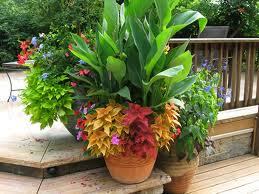 If one planter is not thriving, you can relocate it to a more hospitable location. Use this as a guide for setting up your permanent garden spaces. 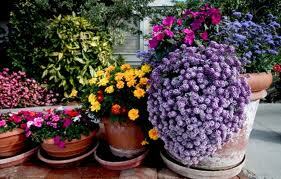 It’s easy to swap out window boxes as well, if one side of the house is not producing as well as another side. Hanging baskets are another option that’s easy to experiment with— select blooms that tend to run and hang down for a more dramatic effect.